As our Blessed Mother stood before the Cross of her Son, she was compelled by love to adore the wounds in His sacred hands and feet. She was drawn to gaze at the nails that pierced her Son as they fixed His hands to the Cross. Such cruelty. So merciless. The pain caused by these nails was excruciating. All our Blessed Mother could do was to watch in love and ponder the wounds inflicted upon her divine Son. 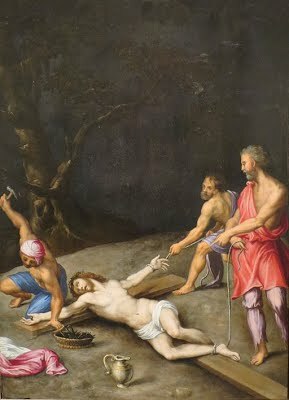 Why did they nail Jesus to the Cross? It was to fulfill the Scripture that He was nailed to the Cross. Isaiah the prophet said, “He was pierced for our sins, crushed for our iniquity. He bore the punishment that makes us whole, by his wounds we were healed” (Isaiah 53:5). “By His wounds we were healed.” What a mysterious statement. How is it that the wounds of Jesus bring healing to the world? As our Blessed Mother contemplated this great mystery, and adored the wounds in her Son’s hands and feet, she would have recalled the rest of Isaiah’s prophecy, “We had all gone astray like sheep, all following our own way; But the LORD laid upon him the guilt of us all. Though harshly treated, he submitted and did not open his mouth; Like a lamb led to slaughter or a sheep silent before shearers, he did not open his mouth” (Isaiah 53:6-7). Jesus embraced the Cross and willingly allowed Himself to be pierced for our transgressions. He took upon Himself the consequences of our sin and paid the price of death. In this act of freely giving His life as the spotless and innocent Lamb, He destroyed the law of death and transformed sin and death into new life. The mystery of Jesus’ suffering as the innocent Lamb is deep and beyond comprehension. Our Blessed Mother contemplated this great mystery of suffering in her heart and knew, by faith, that every wound and every nail brought untold grace into the world. She saw in her crucified Son the effects of the sins of the world. But she also saw sin destroyed by His free and innocent embrace. Very often we fail to understand that our Lord’s suffering and death is a mystery. We fail to comprehend and to be grateful for the great mystery of His innocent suffering which sets us free. Reflect, today, upon the wounds of the innocent Lamb of God. Gaze at His wounds with our Blessed Mother. See His wounds as the price of your sins. Allow your heart to be filled with deep gratitude as you ponder this unfathomable mystery. My dear Mother, only your faith could penetrate the mystery of suffering, just as the nails penetrated the hands and feet of your divine Son. Only your love could comprehend the mercy and healing offered by your Son’s wounds. Draw me into this gaze of yours so that my mind and heart may penetrate its meaning. My dear Mother, I also offer to you and to your Son the wounds that afflict me unjustly. May I never complain or turn away from the opportunity to give myself freely, and to accept suffering, for the healing of others. Teach me to imitate this great mystery of your Son in my own life. My pierced Jesus, Your mother gazed with love at the wounds in Your hands and feet. She saw and believed in the healing that was made possible by Your free embrace of such cruelty. Give me the grace I need to also gaze at Your sacred wounds and to penetrate the meaning of their mystery. I thank You, dear Lord, for the abundant mercy You have poured forth from Your sacred wounds.